Program #ZINH029. Recorded in Auburndale, MA on March 25, 2003. 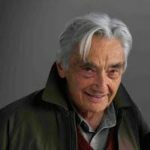 Respected historian Howard Zinn joins AR’s David Barsamian in conversation for this live feed. Zinn’s extensive historical and current perspectives combine to provide critical insight on the situation in Iraq and the world. His breadth of knowledge and engaging style make this a program not to be missed.